In the six months since Reggie, with the help of her best friend Aaron, rid Reggie's brother Henry of the Vour that possessed him, the Vours have been relatively quiet. But now the summer solstice is approaching, and the Vours begin to reign terror on them once more. Then, Reggie is visited by the most unexpected person, who helps reveal just how deeply infiltrated the Vours are in Reggie's life and helps her realize that her strange powers have put her in far more danger than she really knows. Like its prequel, Soulstice carries a thick, palpable air of danger and suspense that is unsettling and engrossing. In this sequel, readers learn much more about Vours and how they operate, answering some unaddressed questions left in The Devouring, and at the same time further scaring readers as Reggie discovers that one person after another in her life is somehow involved with the Vours. Reggie also explores fearscapes a bit more, which are imaginative, creepy, and sometimes a little gory, but also explore the idea of fear and its causes, effects, and manifestations. Though Soulstice doesn't have the downright, creepy feeling that the first book did, the characters are further developed and the stakes are higher, making it easy to get attached to them and be concerned for their well being. The unexpected, jarring ending will leave you exclaiming with injustice and fear for Reggie and her friends, and hoping for a third book very, very soon. Cover Comments: I really like how they've continued with the same sort of cover for Soulstice that they had for The Devouring. I think that The Devouring's cover is gorgeous, and I like the plumes of smoke-like substance. The yellow is a really cool color, and I think that this whole cover is very well done! 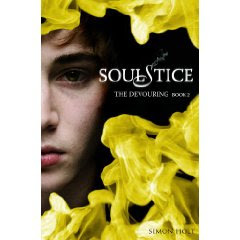 I have put SOULSTICE on my ToBeRead list. I don't know much about this series but the books surely have great covers. Thanks for the review. Sounds creepy-awesome. Great review - you really showcase the feelings of unease! i am a 12 year old girl who has fallen in love with soulstice. i am the youngest person i know who read these books.i love Quinn and Aaron.and i think Mitch and Keech are interesting.i would love for someone to make a movie using the same characters on the book covers. i can't wait for book 3. a can relate to aaron and reggie because i,too, am a scary loving, horror novel freak.in fact, all my friends think i'm weird.